The oil crisis of the 1970s meant that Americans had to wait in long lines to fill up their cars. But in the Netherlands, the government decided that the best way to conserve fuel was to ban cars for one day a week. How did people cope? They took their horses on the highway. 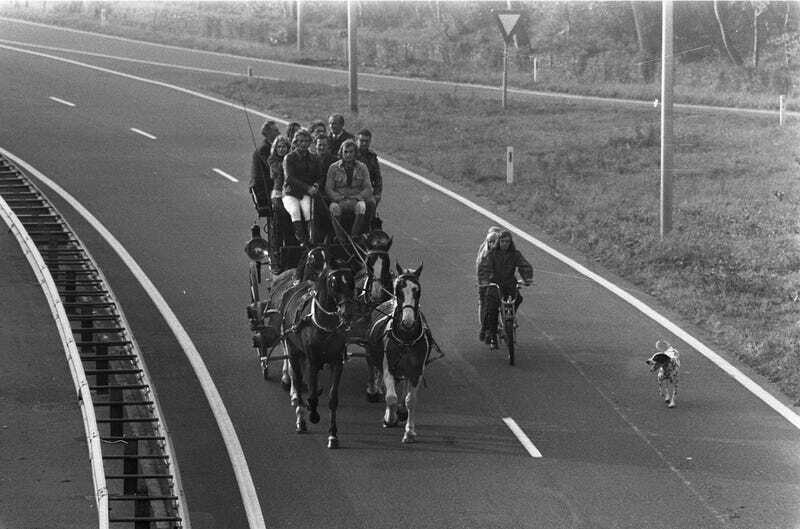 The Netherlands introduced "Car-Free Sunday" in November of 1973, taking nearly all of the nation's 3 million private cars off the road. Some people rode bicycles, others took the bus. But still others rode horses. Below, a photo of four horsemen riding through the streets of Amsterdam in 1973. People even decided to have picnics on the highway. The picture below is sometimes passed around by idiotic "history pictures" accounts on Twitter as being from the United States. But as you can see, the photos are very clearly from the Netherlands. So what happened if you decided to drive your car anyways during Car-Free Sunday? You got pulled over by these guys. The Car-Free Sundays rule stopped in January of 1974, but the Dutch were really no strangers to the practice. According to the website Bicycle Dutch, Car-Free Sundays were instituted during other periods of energy scarcity like in World War II. But the 1970s version really changed the mindset of people who couldn't imagine a world without cars. "Not only did they show once again what cities looked like without cars," Bicycle Dutch writes. "They also made it possible that other forms of transportation, less oil dependent and in particular cycling, were seen as a viable option for every day transportation."